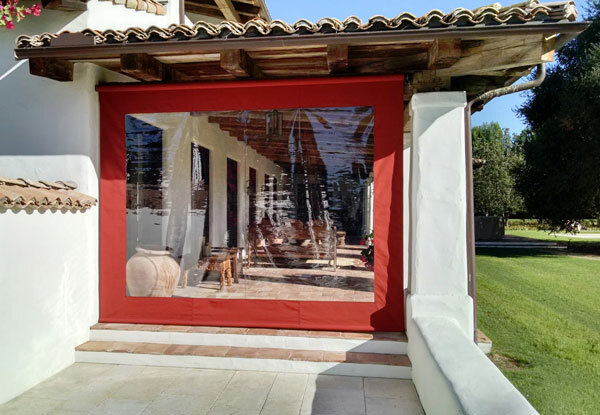 SunMaster Products is San Diego County's best value for attractive, high quality drop roll curtains which will make your home or commercial outdoor living space as comfortable as possible for your family, guests, business patrons, and employees. At SunMaster, we are committed to providing excellent customer service, and our knowledgeable sun shade system specialists will work closely with you to design the ideal customized shade solution to fit your specific requirements, one which will complement the look of your home or business's patio or deck, while providing your outdoor living space with the needed relief from the elements. Drop roll curtains are a very effective way of providing covered outdoor spaces with protection from sun, wind, rain, as well as for adding desired privacy. At SunMaster, our outdoor roller shades can be mounted to both wood and aluminum patio and deck covers, using either a vertical drop curtain equipped with a weight pipe or a side track operating system that allows the shade to be opened or closed at any position along the vertical drop. 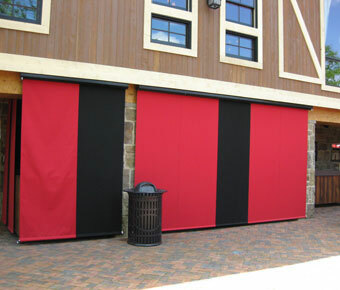 We offer our drop roll shades in an extensive selection of fabric types and colors, both open weave and solid, and in both manual and motor-operated designs. We proudly recommend the full line of Sunbrella fabrics for use in our vertical drop roll and side track roller curtains. Sunbrella is an acknowledged leader in the outdoor textile industry and backs their exceptionally durable fabrics with a 10 year warranty. 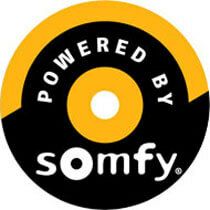 In addition, we are an authorized dealer for Somfy motorized controls, and can outfit our outdoor roller curtains with Somfy's wide selection of innovative automated control systems, including their remote control, hardwired switch, and Z Wave operating systems, providing our valued clients with the most efficient and convenient drop roll curtain operation possible. Call SunMaster Products today for a free onsite estimate on a drop roll curtain system for your home or business property's patio or deck. We service all of San Diego County and the surrounding areas. SunMaster Products, Inc. holds California State Contractor's License #288419, and is bonded and insured. For both wood or aluminum patio covers. Ideal for keeping out heat, cold, rain, and wind, as well as for providing privacy. Can be designed with either a weight pipe or side track option – to provide your deck or patio with an "outdoor room" atmosphere. Both manually-operated and motor-operated designs available. Offered in an extensive selection of fabrics, both open weave and solid, including: 100% solution dyed woven acrylics, PVC coated polyester/fiberglass mesh, vinyl coated polyester, vinyl coated polyester shade fabric, and fiberglass charcoal mesh (bug screen). Featuring Sunbrella fabrics, and their over 350 fabric colors and patterns, backed by a 10 year warranty. SunMaster installed this manual drop roll shade in Valley Center, CA. We used fabric that is 90% textilene to provide our client with the desired shade from sun exposure on their outdoor patio. Textilene fabric provides UV resistance and is easy to clean. 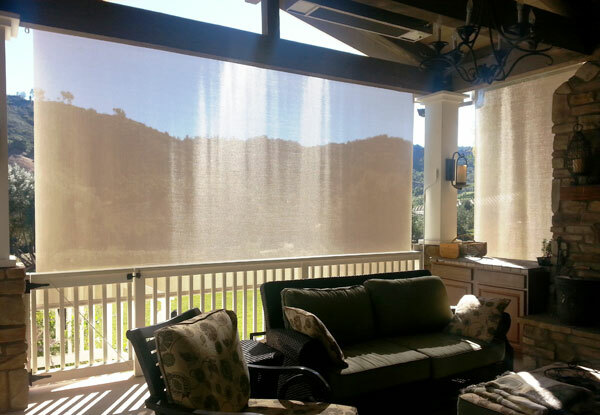 We installed these manual drop roll shades in Rancho Sante Fe, CA. Our client wanted protection from the wind and rain but didn't want their view obstructed. We used Sunbrella fabric as the frame for these shades and clear vinyl for the center. At SunMaster we work with our clients to meet their specific needs. At SunMaster, we proudly use industry-leading Sunbrella fabric for the majority of our outdoor awnings and drop roll curtains. 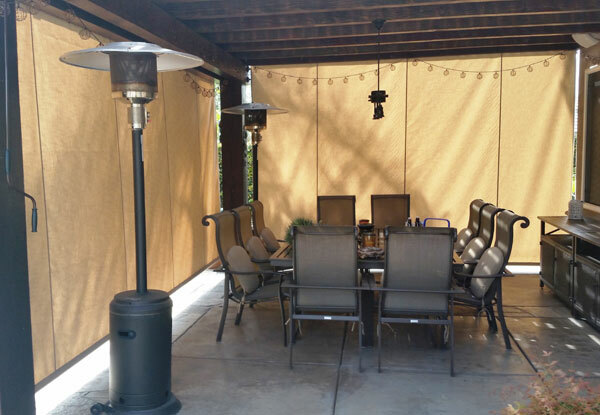 We installed these Sunbrella drop roll shades for a Vista, CA patio. 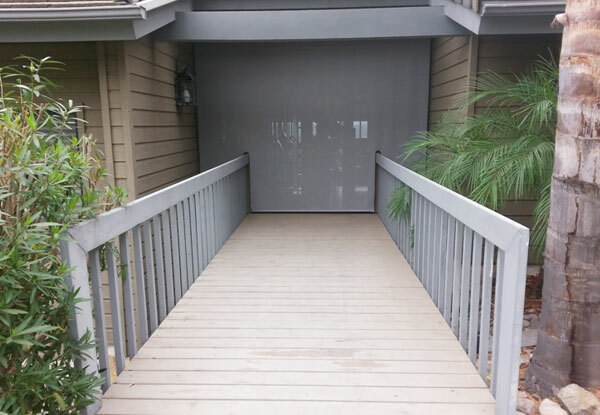 This manual drop roll shade in Vista, CA was built and installed by the experts at SunMaster. We used Sunbrella fabric to create this outdoor, partially enclosed BBQ and dining area for our client. 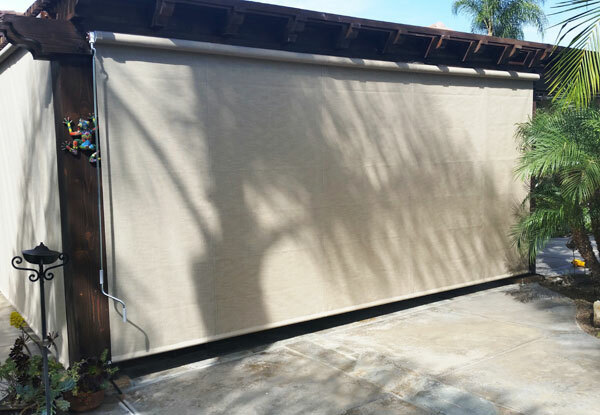 SunMaster installed these grey drop roll shades in Escondido, CA. Our textilene material blocks up to 90% of the sun's rays to protect the homeowner's wooden doors from sun damage.